Genesis Boogerman: A Pick and Flick Adventure (USA) in 20:14.0 by Kiske. Boogerman is a jump-and-run game where the protagonist flicks boogers and farts at enemies in order to stand a chance against the evil Boogermeister. 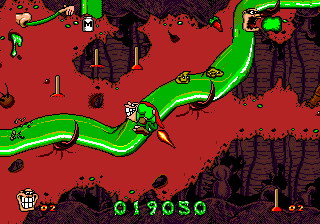 The game features about 20 levels of dirt, slime and bad taste in worlds like "Mucous Mountains", "The Pits" and "Flatulent Swamps".